Katherine Galvez Aguirre is the Owner/Publisher/Editor-in-Chief of FitnessX Magazine. She has been actively involved in the fitness industry for the past 12 years working as a group exercise instructor, certified personal trainer, sports nutritionist, transformation specialist, PT manager, fitness director and fitness company owner. Kat has competed and placed in the top 5 in fitness, figure, fitness modeling, bikini and power lifting. She started several boot camp programs in Alabama, Tennessee and California to help hundreds of people get fit and healthy. BillyBow Aguirre was born in 1961 in Los Angeles, California, to Susanne Carter, an entrepreneur and William F Aguirre Sr., who worked for Pacific Bell Telephone Company. His mother has Spanish, Irish, and Basque ancestry, and his father was from a Basque great family (of French & Spanish origin). Self-described as a "dreamer, BIG Dreams," BillyBow left home at 19 and for the next 13 years worked in the U.S.Navy as a food service cook and traveled to various locales as Japan, Australia, Mexico, Philippines, Africa, Singapore, Thailand and Hawaii. Returning to California at the age of 32, he had some setbacks with his dreams of working in the entertainment industry. But BillyBow continued pressing on with his lifelong dream. After leaving the Navy, he worked in the culinary arts and Information Technology industry at the San Diego Tribune, Deluxe Labs and Jefferies & Company. He bought a camera and shot some of the famous fitness competitors and bodybuilders like Ronnie Coleman, Jay Cutler, Greg Plitt, Iris Kyle, Sherlyn Roy, Stacey Naito, and Christine Le Monde. BillyBow also filmed the professional bodybuilders and fitness competitors at the 2007 Mr. Olympia. BillyBow and his partner (wife) Katherine Aguirre have attended numerous fitness events like the LA Fit Expo and Idea World Fitness Convention where they conducted interviews with the leading innovators in the fitness industry like Elaine LaLanne, David Weck, Tommy Saunders, Marc Lebert, Todd Gates and Maria Kang. He was LIVING his DREAM! BillyBow's entrepreneurial skills help establish FitnessX Magazine with Katherine Aguirre who is the creative director, editor-in-chief and co-publisher. His new project is merging both actors and actresses with fitness stars on the cover and in the pages of FitnessX Magazine. BillyBow's whole motivation is to live the dream with inspiring and motivating people to live a healthy lifestyle through reading FitnessX Magazine. The tagline says it all--"Inspiring You To Live Well...Naturally!" 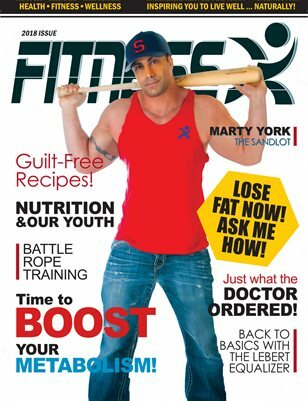 FitnessX Magazine cover model, Marty York. He is an actor and fitness star. Read his inspiring story on page 18!